Winslow United face a tough tie when they travel to Saxton Rovers in the semi-final of the Berks & Bucks, Senior Trophy on Saturday, 2pm. The county cup competition for step 6 and 7 sides is down to the last four and United’s opposition Saturday are a strong unit being unbeaten in the North Berks League, division 1 this season. Their ten league games has seen them drop just two points from their campaign. Their Caldecott Road ground has seen Rovers net 26 times in five wins and a draw and concede just 5. On the road Rovers have won every four of their games. In this season’s county cup a second round 3-2 home win over Faringdon Town was followed by a 5-0 win at Singh Sabha Slough in round three before Kintbury were dispatched at Caldecott Road also by a 5-0 scoreline. Buckingham Athletic and Winslow United are both at home as they look to progress into the last four of the Berks & Bucks Senior Trophy on Saturday. Mark Carter’s side play host to Marlow United with entry to Stratford Fields free of charge. The winners will entertain Newport Pagnell Town reserves in the semi-final. Paul Alleyne welcomes Langley to Elmfields Gate with a trip to Saxton Rovers awaiting the winners. Both games start at 3pm. Berks & Bucks Senior Trophy, quarter final draw: Find out who our teams face! November 20, 2017 / admin / Comments Off on Berks & Bucks Senior Trophy, quarter final draw: Find out who our teams face! Our three sides in the Berks & Bucks Senior Trophy avoided each other when the draw was made this lunchtime. Buckingham Athletic, Newport Pagnell Town reserves and Winslow United were all pulled out out of the trophy separately, with only the Swans set to travel. So what do we know about the teams our sides have been paired with? Buckingham Athletic host Marlow United, who were runners-up in the competition last season. Marlow, who defeated Aston Clinton 3-2 in the last round, are currently fourth in the Thames Valley Premier League. Winslow United bagged their first home draw in this season’s competition with current East Berks League, Premier Division Champions Langley (Slough) set to visit Elmfields gate. Langley are currently second in the division this season having won every one of their five league matches to date. Newport Pagnell Town reserves head to the winners of the tie between Chalvey Sports, the current Uhlsport Hellenic Football League, Division 2 East Champions, or Sandhurst Town, who play in the Uhlsport Hellenic Football League, Division 1 East. The two sides battle it out this Saturday to see who takes the final quarter-final place. Ties will take place on Saturday 3rd February 2018. Berks & Bucks Senior Trophy – Who lines up in the quarter-final draw? November 19, 2017 / admin / Comments Off on Berks & Bucks Senior Trophy – Who lines up in the quarter-final draw? The Berks & Bucks Senior Trophy is an exciting competition for Sports Shots this campaign. We are down to the quarter-finals and we still have three sides from under our umbrella who will go into the hat. Buckingham Athletic, Newport Pagnell Town reserves and Winslow United are joined by Marlow United, Saxon Rovers, Kintbury Rangers and Langley, while Chalvey (WMC) Sports or Sandhurst Town complete the draw. Winslow United are into the last 16 of the Berks & Bucks Senior Trophy. 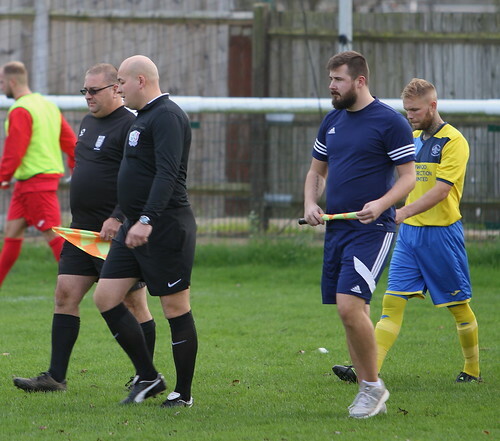 The Spartan South Midlands League, Division 1 outfit ran out 4-1 winners in their county tie against Buckingham Town in a typical local derby at Manor Fields. Simon King put the visitors ahead after he found himself in space on the edge of the area before drilling low past the advancing Ryan Thrussell on 14 minutes. Six minutes later United’s leading scorer Aaron King found himself in the same position. He calmly sided-footed home into the far corner giving the exposed Thrussell no chance of saving and putting the visitors two-nil ahead. Good opportunities came at both ends but the game swayed in the two minutes leading up to, and after, half-time. With the Robins committing bodies forward it was Winslow who saw a counter-attack breakdown as they missed an opportunity to put the game beyond doubt. Within sixty seconds Kelvin Osei-Addo had pulled a goal back for Town; the striker lifted the ball over Aaron White from an acute angle into the roof of the net. With the Robins buoyed from getting back into the game, their expected positive emergence for the second period was short-lived as Sean Coles ran onto a diagonal ball, holding off a challenge, before firing home to restore Winslow’s two-goal advantage. The Robins skipper Sam Bearman then saw red after receiving his second yellow card before Coles wrapped up the victory from close range just twelve minutes from time. Buckingham Town: Ryan Thrussell, Levi Squillace, Murdy Maki, Steve Gavrovski, Sam Bearman, Jenali Blair, George Shrieves, Dan Bevis, Dan Simpson, Kelvin Osei-Addo, Orlando Joao. Subs: Warren Garcia, Sam Tamakloe, Raheem Khan, Diego Vazquez. Winslow United: Aaron White, Mitchell Collins, Ryan Freshwater, Steve Garbutt, Marcus Hussey, Alex Kedzierski, Sean Coles, Simon King, Aaron King, Daniel Delderfield, Grant Karwacinski. Subs: Tom Brindley, Matt Cruse. Matches to be played on Saturday 14th October at 2pm. The Robins made the short trip to Mursley United on Saturday to play their Berks and Bucks Senior Trophy first round tie. Mursley had only been defeated once in seven league outings this season and a tricky afternoon lay ahead for Gary Ollard’s men. Buckingham started brightly and had the lions share of early possession with Dan Silver and Dan Simpson causing problems with their pace and Simpson was unlucky not to open the scoring within five minutes as a tempting low cross just evaded him with the goal gaping. Mursley were causing problems of their own at the other end Thrussell made a smart save before timely interceptions from first Gavrovski and then Muya kept the scores level. Jamie Nicholls had the ball in the net for Town on 15 minutes but had his effort struck off for offside as Buckingham tried to get their noses in front. There was then a delay in play as several Robins players were ordered from the pitch to change their socks due to some having white trim and some not and the stoppage seemed to affect the match in a negative way as amid the confusion the referee issued a flurry of needless yellow cards to players from both teams. Dan Silver put Town ahead just before the half-hour mark as he raced through the home defence and shot powerfully home and it was Silver again, six minutes later, who doubled Buckingham’s advantage with a low shot into the bottom corner of the net. Mursley’s Ellis Spence was shown a second yellow card before the break and was sent off by the referee and he could count himself unlucky as neither offence warranted him seeing red. Former Robin Lewis Delahaye then broke clear of the visiting defence and chose to square the ball when he looked certain to score and the two follow up efforts were blocked by Buckingham’s back line as Mursley tried to reduce the deficit before the break. The second half opened with the home side showing great energy and determination and ten minutes in they got themselves on the scoresheet as a long cross was steered home between Thrussell and the post. Five minutes later left back Jordan McDougall almost equalised as he broke away with pace but saw his fierce shot hit the crossbar and ricochet away to safety. At the other end Nicholls saw his shot across goal just miss at the far post and Silver spurn his hat-trick goal as he fired over from close range. The home keeper Sam Jay had to leave his area to head away to safety as Simpson raced onto a through ball with ten minutes remaining and as the game swung from end to end Thrussell went full-length to keep out a powerful goal-bound free kick from the edge of the box. Buckingham finally ended the contest in added time as Raheem Khan clipped a precise ball over the home defence for Jelani Blair to fire home. Ties to be played Saturday 16th September 2017 at 3pm.